Paris was built for horses and buggies. While the main streets are broad, the inner streets are anorexic. If you want to witness the war on the car, watch a Renault double park there. We have nothing but space, and we are stingy; they have no space and still they share. This echos many of my observations. I especially agree with her comment that it is strange that Toronto (and even more, Hamilton) claims that we don't have enough space for bike lanes, pedestrian streets or patios while very dense and bustling Paris has been willing to dedicate scarce road space to pedestrians, bikes and public transit. This is even more impressive considering that essentially no one cycled in Paris 10 or 15 years ago! Similarly, in Vancouver it is council pushing the cycle lanes and trying to convince the public that it is a good idea. The difference here is political leadership (or its absence). I am always amazed at the repeated claim that fitting Light Rail Transit (LRT) in Hamilton is a big challenge. We have very wide, under-capacity streets so it should be a cinch compared with European cities, like Grenoble and Bordeaux, that have managed the trick. The unspoken assumption is: It will be a challenge to fit in LRT or bike lanes or pedestrians ... without taking any space away from cars. 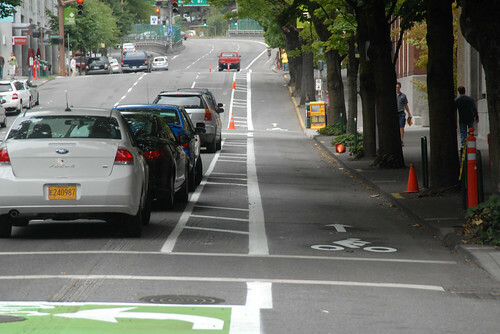 Parking, 2 traffic lanes and a buffered bike lane. Hamilton needs to do this ASAP on Cannon, Queen, Catharine, Wilson and Main. We need complete streets in Hamilton, and we need them now. I experienced the amazing sight of Portlands neighbourhood greenways today. Incredible to see a few small changes turn a typical, quiet residential side street into a complete street that gives cyclists a safe route around town. Streets like Dunsmure, Central, Napier, Barnesdale, Cumberland, George etc.... are perfect candidates for this treatment...cars still have easy access, yet cyclists are also given easy access. You are exactly right...leadership. We have virtually none. 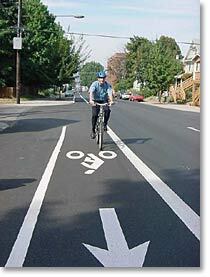 Looks like Portland is a very progressive city. I must admit I was shocked Jason, when you said there were a ton of one way streets too. That was until I looked at the photo and was wowed! progressive yes. Yet most of what they've done here is really simple. Hamilton could do this to our major streets and quiet side streets in the next 2 years with some adequate budget funding and research by staff. Why am I seeing these ideas for the first time in my life on my own when we pay a ton of staff to be keeping Hamilton at the cutting edge of urban design, transportation and liveability?? Let's spend all that salary on a small team of 3 or 4 getting a fully paid field trip to Portland for 2 weeks and they can come back and make recommendations to council. We don't need to be paying hundreds of thousands in salary simply to have people making sure the lights on Main and Cannon are still timed to allow freeways to exist.